You are noticing all of the plastic and chemicals you use in your life, and you want to make a change? We all need to shift how we do things to take care of the environment. One of the best ways to start is to think about the things we do the most- shop for groceries, do laundry, eat breakfast, and start there. If you start with your regular habits (instead of your big purchases, you can actually have a greater impact! So, what is one thing I feel like I am doing all the time? Anything you can keep using is a huge win for the environment. The longer a "use-life" an object has, the better. For example, I can use the same unsponges for years, where a regular sponge will only last a month or two before it gets janky. The more you can reuse something, the less garbage it makes. This goes for what you already have too- if you already have a dish brush, use it until it is just a nubbin before you get a new one! Equally great is refillable stuff! For soaps, you can stop buying small bottles and refill the bottle you already have. If there is a zero-waste or bulk store near you, you can refill your bottles there. If not, you still have options like The Refill Revolution. It allows you to skip the container and eliminate plastic waste. Soap dishes, drying racks, and those spare spoons you need to replace the ones you inexplicably lose are all available used. Save money and minimize the waste you create by looking secondhand first. Lots of the things on this list are not mainstream yet, but you can still find all of them on Amazon. I highly recommend checking Etsy stores and small stores like The Refill Revolution or Tiny Yellow Bungalow first. Check and see how far the nearest zero waste store is- my hometown has one! You may be surprised! 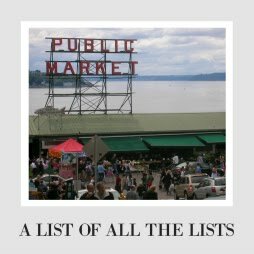 This blog does use affiliate links for Amazon and Etsy, which means we make a teeny bit of money if you buy something you click on here. That said, I totally believe what I said before. You do way more good if you shop local or from small sellers. Shop there. Ok, dish time! Let's do this! 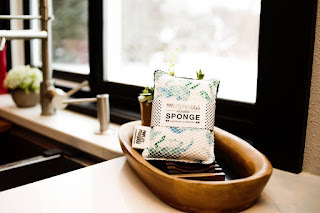 Rather than use the Scotch Brite sponges that are wrapped in plastic and made with plastic, consider switching to “unsponges” or biodegradable sponges instead. We use marleysmonsters unsponges. We got three at the beginning of 2018, and we are still using them now (though we added 2 more to the collection). We have a container in our kitchen that we throw them in (wish dish rags and cloth napkins), and they all get laundered once a week. It's super simple. I love these unsponges, and I would recommend them to anyone. There are lots of other unsponge options. Check out these ones from HuggableEarth, TheLittleWanderersCo, TheHealthyEarthCo, TheGreenHaven, and PacificNWNursery. Another option is to use a biodegradable loofah sponge instead. Here is another one to check out (with perfect reviews). They won't last as long, but they will completely biodegrade. Full Circle also sells a walnut-based sponge that will biodegrade as well. If you need something even tougher, this Redecker copper scrubber might be great as well. 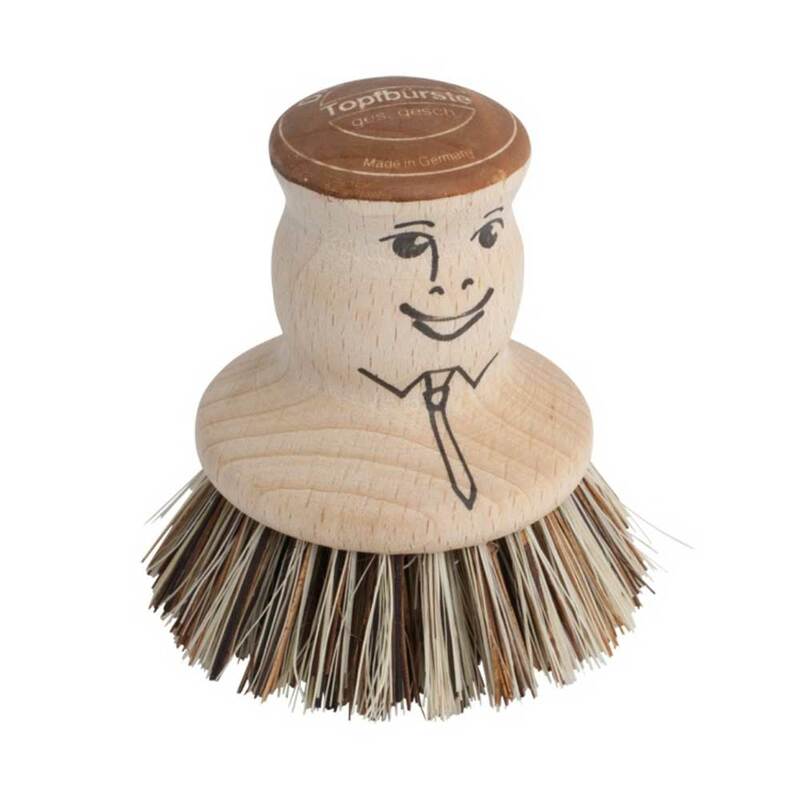 These brushes from Redecker are perfect for getting things clean AND they are made of wood so they biodegrade. I think this little brush is just about the cutest thing ever, though I wonder if you would find the smile mocking after enough dishes. Then again, you could use your aggression against the patriarchy to get your dishes clean? You could also get this Redecker brush with a handle if you want something less fraught with gender stuff (and you can get replacement heads). Redecker sells bottle brushes as well. 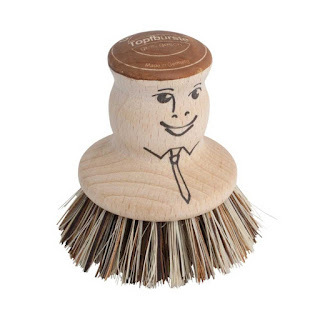 Full Circle also makes a bunch of models of dish brushes, and this one is our favorite. For the longest time, I was all about Dawn Dish Soap (you can do so much with that stuff), but now I feel a little more skeptical. It is made with petrochemicals, so it brings a lot of unwanted stuff into your home. No matter what you buy, try for something refillable or AT LEAST in bulk. The larger containers actually create less plastic waste (one giant bottle vs 5 or 6 small bottles really adds up). If you want to get in this habit, The Refill Revolution sells large reused containers of dish soap that you can buy refills for from now on. Then they have refills of dish soap you can buy as well, which is what we are now doing. Biokleen is a pretty great company for this! For a few months, we have used biokleen dishwasher powder for our dishwasher, and it works as well as anything we used to buy at the store with our pretty lame dishwasher. Biokleen also sells a gel version if you feel more comfortable with something more familiar. We bought our first set in a container, and now we buy refills. I would highly suggest using containers you already have; a yogurt tub or coffee container could hold the powder as well as anything else. This honestly is an easy one to switch. Drying Racks get tons of use, but you don't need to buy one all that often. I would recommend looking secondhand first- you may be surprised! People move and what they need changes. The most waste-free options include bamboo and metal (plastic ones may not last as long, though those are most of the ones made in the US). Bamboo will decompose (so way better for the Earth) and metal can be reused and then recycled. From a waste perspective, these are better options, but you have to weigh your own priorities. For Bamboo, check out these racks from Totally Bamboo and HBLife Bamboo. For metal, you can't do more minimalist than these over the sink racks, which collapse (or this one with perfect reviews rolls up) and could easily be put in the drawer (I wish we had one of these when we were in an apartment). For a more conventional rack, Rubbermaid makes coated metal racks here in the US that look like they will last. For something more stylish check out this cross one, this sturdy one, and this expandable one (you can move it into the sink too). 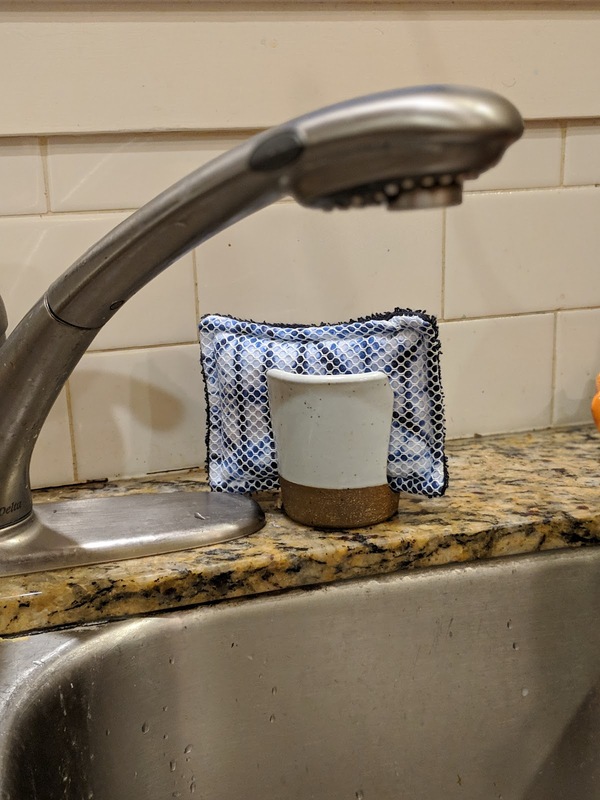 Sometimes a reused soap dish or even napkin holder can make a perfect place to hold your sponges, but if that is not for you, there are some simple and stylish options that makes your kitchen sink clean and beautiful. We have a beautiful, simple holder from SawyerCeramics, but Etsy has so many options for beautiful ceramic holders. 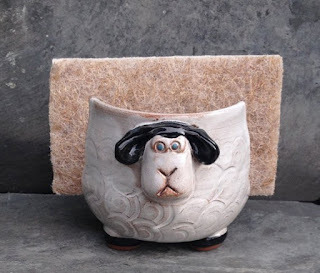 Check out PurpleHeatherPottery, mudworks, cinderceramics, scarlettwares, and TrilliumFineArts. If ceramics don't fit your style, these concrete folders from CRETETATION are super cool too. If you use a brush too, I think this scarlettwares holder with spots for both could keep your counter look cleaner as well. If you want something in the sink that isn't plastic, this looks to be your best (most plastic-free) option. I finish this blog with another sink's worth of dishes waiting for me. It never ends! What is the best eco-friendly switch you made for doing your dishes? Want more eco-friendly ideas for every nook and cranny of your house? 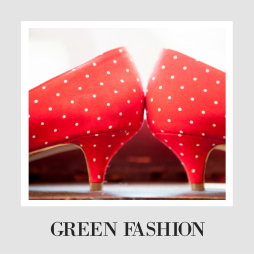 Check out the Green Home page for tons of posts and ideas!